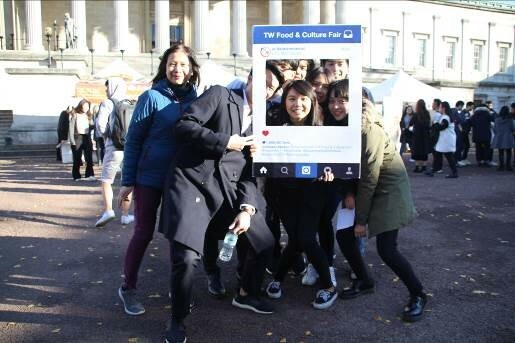 The Taiwanese Student Society of University College London (UCL), in conjunction with the association for Student Unions representing the Republic of China in the United Kingdom (SUROCUK), organised and hosted a successful Taiwan Food and Culture Fair for the fifth consecutive year. The fair, designed to showcase Taiwanese traditional cuisine, was held in central London on Sunday, November 18, in a central courtyard in the grounds of UCL. Participants were invited to sample traditional Taiwanese street food and refreshments such as braised pork, beef noodles, stewed eggs, and bubble tea, at the many different food stalls recreating the atmosphere of Taiwan’s famous night markets. They could also learn about the history and customs associated with many of the dishes on display, as well as tasting the freshly-cooked items for themselves. The Education Division of the Taipei Representative Office in the UK set up a Study in Taiwan stall at the fair to promote the various opportunities to study at universities in Taiwan and provide information about the scholarship programmes offered by Taiwan’s government for international students who want to study Mandarin or do a degree there. Dr. Nicole Yen-Yi Lee, the Director of the Education Division, worked at the stall, handing out brochures and answering questions from interested students. The Taiwan Food and Culture Fair was an enjoyable experience for all involved, bringing together students and visitors with a wide range of nationalities. Photo:Dr. Nicole Yen-Yi Lee, Director of the Education Division, Taipei Representative Office in the UK, with members of the UCL Taiwanese Student Society at the Taiwan Food and Culture Fair.